Journey Not About To Be Eclipsed At Darien!!! Classic rock came to life Wednesday night as a very large crowd witnessed at the Darien Lake PAC. Headliner Journey played a crowd pleasing set that made some, forget about former singer Steve Perry. Despite the solid performances by Foreigner and Night Ranger, Journey was not to be outdone. The band did nothing fancy no over the top gimmicks, they just came out and played the songs and they played them well. Other bands need to take note. 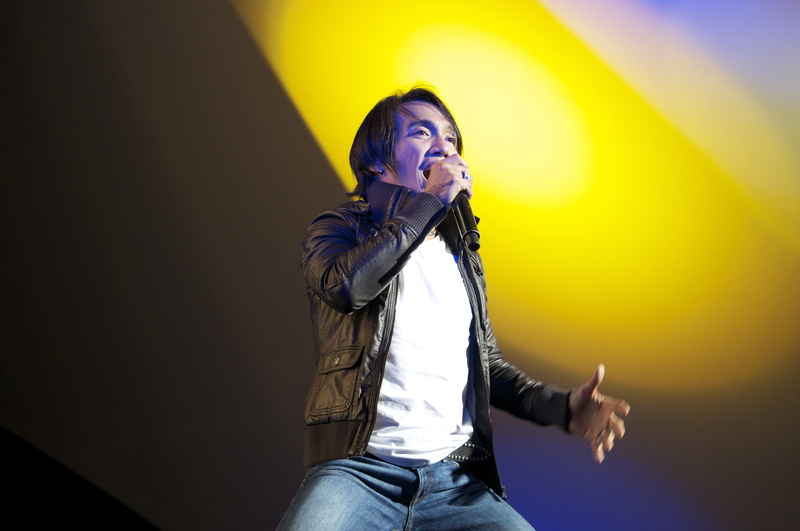 Journey singer Arnel Pineda who has now been in the band for four years showed why the band is still relevant. His vocal comparisons to Perry were the main reason leader Neal Schon brought him aboard. As a frontman, Arnel really takes time to interact with the crowd in mid song. He does the songs and the band justice. The remainder of the band has been together since 1998. The band got the audience’s attention right from the start. Hitting the stage with “Separate Ways” bleeding into “Ask The Lonely” was quite an auspicious beginning. The band also played a pair of new songs off their latest release Eclipse. It was those classic hits the fans really came to hear as the band churned them out one after another. “Stone In Love”, “Who’s Crying Now” “Don’t Stop Believin” and the list goes on. Recent reviews had the bands set down to fourteen songs, but as the night before in Toronto where the band played prior to Darien, both crowds received fifteen. The additional song, Lovin’, Touchin’, Squeezin’ was played for the first two times on this North American leg of the Eclipse tour. Foreigner delivered an extremely solid set. They played all the songs a casual fan would expect to hear. Singer Kelly Hansen even ran out into the crowd during a song. It seems every time this band goes out on a jaunt it has a different member. For this tour returning drummer Mark Schulman was back behind the kit. He had last played with the band in 2002. Founder/Guitarist Mick Jones appears to have put one of the best Foreigner lineups together since its heyday. Former Dokken bassist Jeff Pilson has now been with the band for 7 years. As for the show, the hits sounded really good. The only complaint was the super-extended version of Juke Box Hero that knocked their performance down a peg. Preferably the band could have squeezed out a lost gem or even perhaps a cut off their underrated 2009 release Can’t Slow Down instead. Having never seen Night Ranger before, I did not know exactly what to expect. They started the whole show off with “Lay It On Me” from their new album Made In California. They even slipped The Damn Yankees song “High Enough” into the set. Bassist/vocalist Jack Blades was a former member of that supergroup that also included Ted Nugent and Styx’ Tommy Shaw as he mentioned in introducing the classic tune. From there they ended with the bands big 3 of “Don’t Tell Me You Love Me”, “Sister Christian”, sung by Keagy, and “(You Can Still) Rock In America”. Despite playing for only thirty-five glorious minutes, the performance was impeccable. The three remaining core members Blades, drummer/singer Kelly Keagy and guitarist Brad Gillis, showed why this band is vastly underrated. The show marked Night Rangers first Buffalo area appearance in over twelve years and by the shows end, the crowd showered the band with a very good ovation for an opening act. One wonders how a tour of bands with replacement singers/members can draw so well? Well folks its all about the catalog and how well you can deliver those classic gems. In the end the crowd seemed pleased with the result.